Good morning folks! I have some Contrary Polish swatches to share with you today. Contrary Polish is an indie brand that makes some beautiful shimmer polishes, and I think there will be quite a few that you guys will just love. Each set of swatches show the polish first in indirect light, and then in direct light. The direct light really changed the look of the shimmer so I felt that the second photos were necessary. First up is Aruba. This is one of my favorites that I got to try out and I think this will be one of the ones that you guys will like the most. It's a gorgeous teal blue with a green shimmer. This shade is not actually available for purchase yet - it is a part of the new "The Islands" trio and will be available on Llarowe next week as a part of the Contrary Polish Restock. I've shown two easy coats. Bright Night is a midnight blue jelly with aqua and silver shimmer. This swatch shows three coats of Bright Night alone. This shade reminds me of Halloween for some reason. It's probably the name! But also, doesn't it kind of look like the perfect sky to do some witching under...? 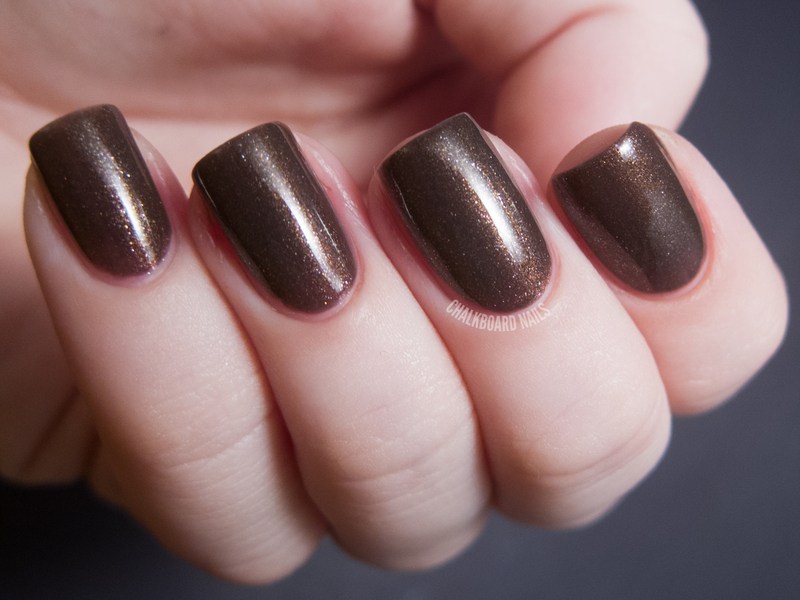 Creeping Moss is an olive toned brown shade with copper shimmer. It feels very "fall" to me. This is two coats of it alone. I particularly love the look of this one in the direct light. It's definitely a unique polish and a perfect fall shade for those of you that prefer a more neutral look. Firebrand is a bright brick red with a vibrant red shimmer. I've shown three coats of it alone here. This one was a little on the thin side, but better thin than too thick, I think! Like Creeping Moss, this shade of red feels perfect for the season. 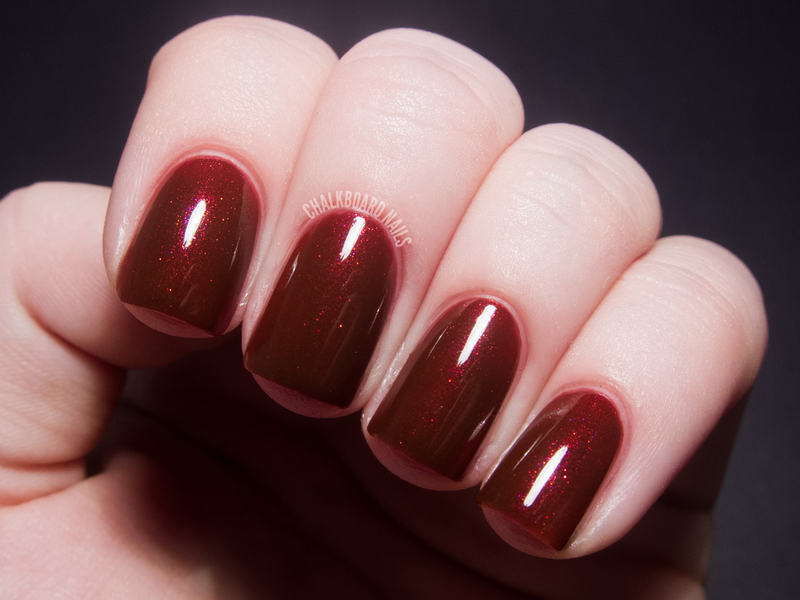 Firebrand's burned, moody red shade is perfectly accented and livened by the red shimmer. Gilded Oak had the heaviest shimmer of the bunch. The formula was also a little thin, so I used three coats for the swatch you see here. This is a "plummy brown"... only slightly more plum toned than I was able to capture here. The gold shimmer is very prominent and lovely. 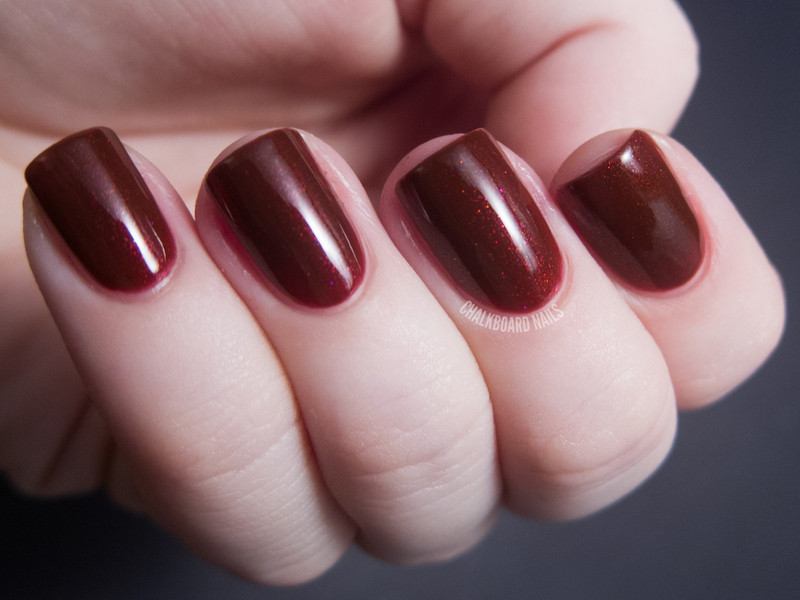 This might even change the minds of some of you who don't love brown polish! Inky Fingers is a lovely blueish purple with a teal shimmer. The combination of the color of the shimmer with the base is divine. This polish is just a touch more purple toned than I've shown here, but it's very close. I've shown two coats. Which ones are your favorites? I am partial to Aruba, Gilded Oak, and Inky Fingers. Contrary Polish is sold in full size bottles on Llarowe. 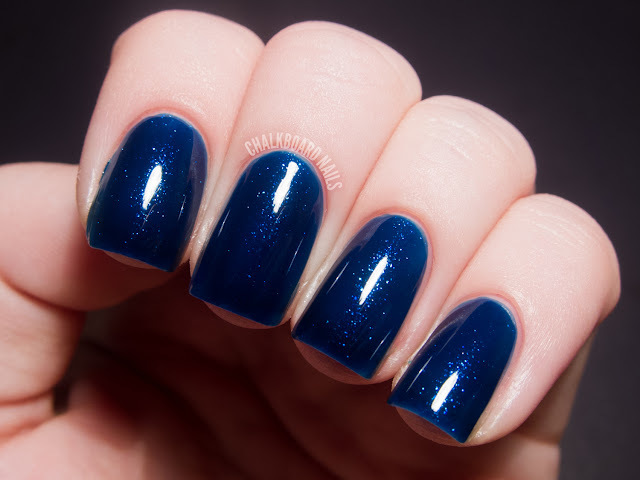 If you are interested in minis, there is ordering information in the sidebar of the Contrary Polish blog. You can also keep up with Contrary Polish on Facebook. These are so stunning! I would have a hard time picking out a favorite! Fireband is stunning! I'd defo buy that for autumn! Creeping Moss and Gilded Oak are GORGEOUS! bright night is so fantastic! Wow, I don't know how to pick a favorite! They're all fab! I am a fan of Bright Night and Inky Fingers :3 So lovely! These are lovely colors for fall. Thank you so much for your gorgeous swatches and the shout out! Carrie makes the most gorgeous polishes! Inky Fingers is gorg! Going on the 'need' list. Absolutely gorgeous. I love shimmers. I love the hide and seek these polishes play shimmer wise! So stunning. I just LOVE Aruba and Bright Night! Wow, wow, wow, that's what I like to see in an Indie - I want them all!! Ohh man, Bright Night and Firebrand do it for me. They're all so individual and different that it's hard to choose. These are all pretty but Aruba is defo my fave! Love such colors! Aruba is less unique than the others, but it speaks to my heart the most.